2. The 7th pay commission which was set up in Feb. 2014 was to submit its report in August, 2016. However, at the intervention of the Government, the report was further delayed and it ultimately reached the Government only in November, 2015.Their recommendations were to be effective from 01.01.2016. Except setting up an empowered Committee of 13 Secretaries to make comparisons between the recommendations of the Pay Commission & the comments from various stakeholders on the 7th Pay Commission, the Government did not do anything so far on the report. It is now more than seven months the report is with the Government. The panel Secretaries have submitted its report. Presumably the Empowered Committees Report will just be carrying the views expressed by all Stakeholders. They, in fact, may be expected to recommend the Govt. to increase the Pay and Allowances. So, there will not be any modification in recommendations of 7th pay commission in the Empowered Committees Report . (i) All the civilian personnel including CAPF who retired prior to 01.01.2016 (expected date of implementation of the Seventh CPC recommendations) shall first be fixed in the Pay Matrix being recommended by this Commission, on the basis of the Pay Band and Grade Pay at which they retired, at the minimum of the corresponding level in the matrix. This amount shall be raised, to arrive at the notional pay of the retiree, by adding the number of increments he/she had earned in that level while in service, at the rate of three percent. Fifty percent of the total amount so arrived at shall be the revised pension. 4.There was perhaps only one and only one positive recommendation made by the 7th pay commission. That was to give some relief in the pension entitlement of the past pensioners. The Government has now proposed to reject that recommendation on the specious plea that the relevant records required for the verification of the claim of the individual pensioners especially those retired long time back may not be available with the Government. 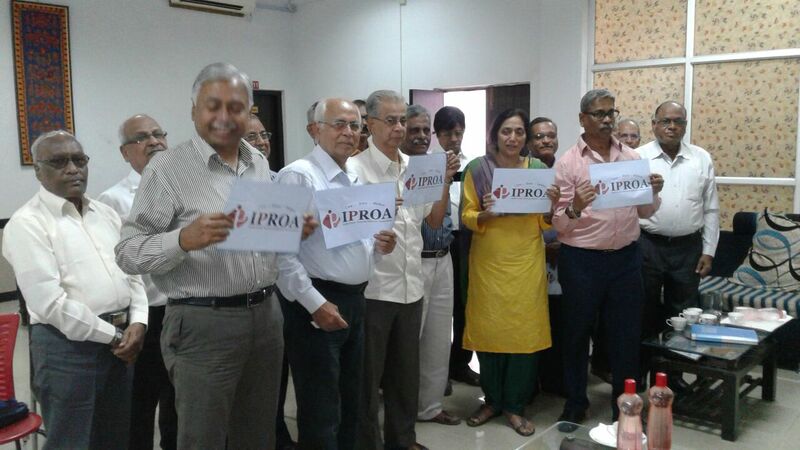 (a) Parity between the past and present pensioners to be brought about on the basis of the 7th CPC Recommendations with the modification that basis of computation to be the pay level of the post/grade/scale of pay from which one retired ; whichever is beneficial. (d) Enhance the pension and family pension by 5 % after every 5 years and 10% on attaining the age of 85 and 20% on attaining the age of 90. (f) Fixed medical allowance for those pensioners not covered by CGHS and REHS to be increased to by ` 2000/-p.m. The issues discussed & the decisions taken in these meetings have been circulated in News Letter 01, dated June 2015 sent through email to all members. 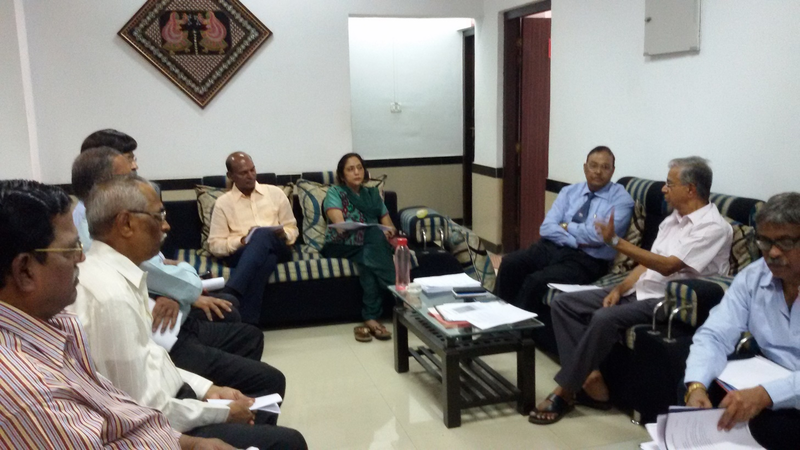 The fourth meeting was held on 10/10/2015 at 03.0 p.m. in the Conference Hall Dadar IQ. The issues discussed & the decisions taken in this meetings have been circulated in the minutes of the meeting sent through email to all members as well in News Letter 02 released on 06/04/2016. 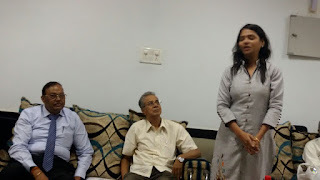 Fifth meeting was held on 19/12/2015 at 11.30 a.m. in the Conference Hall, Dadar IQ followed by lunch. 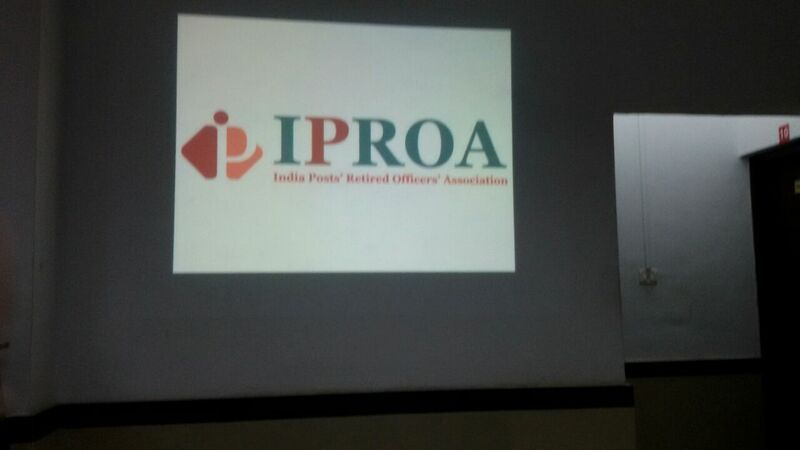 Shri V.K.Khanna gave a talk on “Opportunities to Retired Officers for their gainful engagement”. The Sixth meeting was held on Wednesday the 06-04-2016 at Bungalow No.07/01, Sanjay Gandhi National Park, Western Express Highway, Borivali East, Mumbai- 400066. News Letter 02 dated 06/04/2016 was released by Shri R. Ganesan ex-Secretary to Govt. of India and Hon’ble President of the Association. In between the talk, a visit was arranged in the Tiger Safari Park for all members in a bus at 12.0 p.m. Lunch was organized on the venue (Bungalow No.07/01, Sanjay Gandhi National Park) at 13.30 p.m.
All members visited Kanheri Caves in a separate transport organized by the Secretary IPROA at 02.45 p.m. from the venue and returned back to the venue for hi-tea at 4.15 p.m. The cost of this meeting was shared equally by the attending members by contributing `600/-individually. The minutes of the meeting sent through email to all members. This now can be viewed in the blog. The First News Letter was published in June 2015 covering the issues discussed & the decisions taken in the first three meetings. This was circulated by email to all the members. This is also now put in the News Letter 02 dated 06/04/2016 which was released by Shri R. Ganesan ex-Secretary to Govt. of India and Hon’ble President of the Association. To have more publicity of the Association 100 copies of News Letter 02 were printed at the cost of ` 12,600/-. In this News letter in addition to the minutes of the meetings the list of empanelled CGHS Hospitals has been printed. 20 copies were distributed among the members attended the meeting held at Sanjay Gandhi National Park Borivali on 06/04/2016 .40 copies were mailed @ ` 5/- to Sr. Officers of Directorate, Circle Office, Regional Office Mumbai, Divisional Heads of Mumbai Region & Postmasters of all Head Post Offices of Mumbai Region & Circle Secretaries of Recognized Unions all by name with a personal letter to all signed by me. In the letters addressed to the SSPOs it was requested to instruct Postmasters of HO s in their Division, to furnish the particulars of Gazetted Officers who had retired/retiring & their mobile Telephone Numbers along with their office of payment of Pension to the undersigned. The Postmasters of HOs were also addressed to furnish the particulars of Gazetted Officers who had retired/retiring & their mobile Telephone Numbers along with their office of payment of Pension to the undersigned. It is disheartening to inform that except Shri S.B.Vyhare APMG (Staff ) who had directed PMG (Mumbai Region ) & SSPOs Thane Central Dn directing the Subordinate Office no response has been received so far from any Head Office. The remaining 40 copies are available which are being distributed to the members who did not attend the meeting at SGNP Borivali & attending the meeting today. This now can be viewed in the blog. All efforts are made to ensure that we are able to curtail the expenditure within the subscription received from the members. I am glad to inform that this is achieved as could be seen from the statement of accounts which are being presented by the Hon’ble treasurer of the Association. However it is appealed to the members to pay their subscription in advance for the year 2016-17 to enable us to plan further activities during this year. Some of our members had also attended these outdoor get togethers. The photos can be viewed in the blog. Our maiden trial with the outdoor meeting at Sanjay Gandhi National Park Borivali with the individual contribution of ` 500/-was attended by only 20 members though arrangement was made for confirmed 25 members putting the attending members to bear extra `100/-individually, but was enjoyed by all, if I am not mistaken since no adverse report has been received by me from any attended Officer. The Executive Members of the Association consisting of Shri R.Ganesan President, Ms Humera Ahmed, Vice President Shri U.P.C. Tauro Secretary & Shri W.S.Janbandhu, Organising Secretary met Shri A.K.Dash Chief Postmaster General Maharashtra Circle Mumbai in his chamber on Thursday the 4th February 2016 at 11a.m. Shri P.N.Ranjit Kumar, Postmaster General Mumbai Region & Shri Sayeed Rashid, Director of Postal Services (HQ) were also present. Shri P.N.Ranjit Kumar, Postmaster General Mumbai Region has also assured to help the Association to get the particulars of Officers who had retired/retiring from the Head Offices of Mumbai Region. The details are given in News Letter 2 & This now can be viewed in the blog. As decided in the meeting regarding code for postings on IPROA what’s app Group a separate group with the caption “ MH Circle Postal Veterans “ has been opened for posting messages. 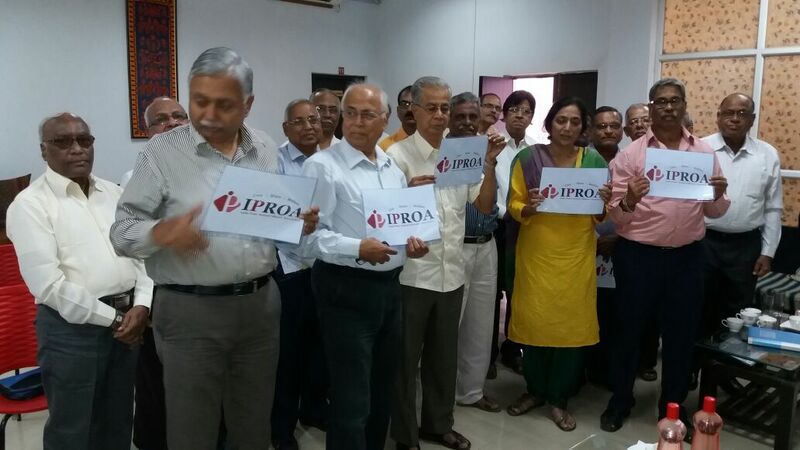 It is a pleasure to inform all that as on date there are 66 Officers of Maharashtra Circle who are participating including 42 members of IPROA .Daily more than 100 messages are being posted by the active Members. As decided in the last meeting we have been successful in designing our Blog with the help of Shri Kiran Reddy Inspector of Post Offices as the charges for the Website were very high by payment of requisite fee for blog though it was decided to create free in the last meeting since payment was to be made for the purchase of the domain. The Blog will be launched shortly. 7 I will now proceed to present some of the important issues before us. As the membership is increasing we may perhaps go for Registration of the Association at the Registrar of Societies Maharashtra. As almost all the Retired Gazetted Officers staying in Mumbai have been contacted, we may perhaps enroll the willing Retired Gazetted Officers of Maharashtra Circle as members of the Association. Before concluding I want to record my gratitude to all the executive members & all the members of the Association who have greatly supported & helped me in the task of running the Association and I am confident that with the support of you all, the Association will scale greater heights. 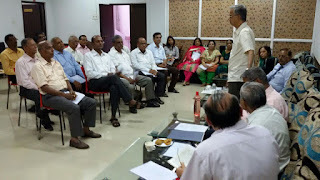 Minutes of the Meeting of India Posts’ Retired Officers’ Association was held on Wednesday the 06-04-2016 at Bungalow No.07/01, Sanjay Gandhi National Park, Western Express Highway, Borivali East, Mumbai- 400066 under the Chairmanship of Shri R. Ganesan Ex-Secretary to Govt. of India, Director General,Posts New-Delhi and President of the Association. 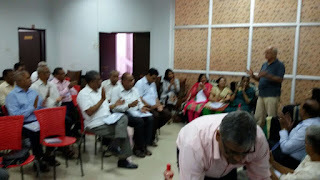 2) Following members were present in the meeting. 3) After completion of registration of membership and breakfast, the meeting started its business at 10.30 a.m. with a few words by Shri W.S. 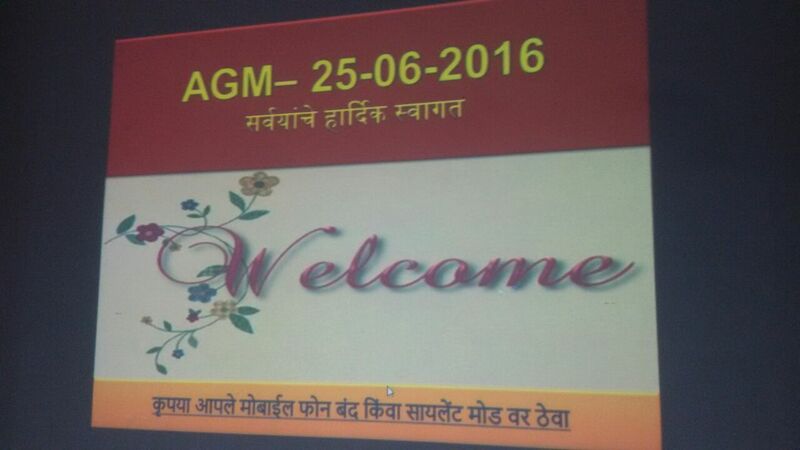 Janbandhu Organising Secretary of the Association who welcomed all members present in the meeting. He mentioned that the meeting has been organized at such distant open environment place just to enjoy optimally keeping aside all our day-to-day problems, worries etc. He further stated that the aim and purpose of formation of this Association is to take care of all members’ difficulties and also to update the current activities of Department including benefits on health-care and pensions etc. Being hectic schedule ahead for the whole day, he requested Col. K. C. Mishra VSM and vice president of the Association to give welcome speech. 4) While delivering his welcome speech, Col K. C. Mishra VSM and Vice-President of the Association, first of all, praised the role of Shri R. Ganesan ex-Secretary to Govt of India, in setting up of the Association for welfare of all retired officers.He further stated that under his leadership the Association would definitely achieve goal for which it was established. 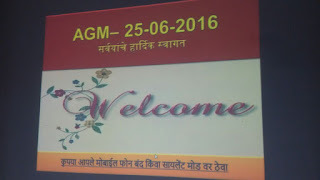 He welcomed all members in the meeting.He mentioned that the contributions made by Shri V. K. Khanna Vice-President of the Association have strengthened the Association’s activities speedily.He also appreciated efforts undertaken by Shri U. P. C Tauro Secretary of the Association in making today’s arrangement successful. 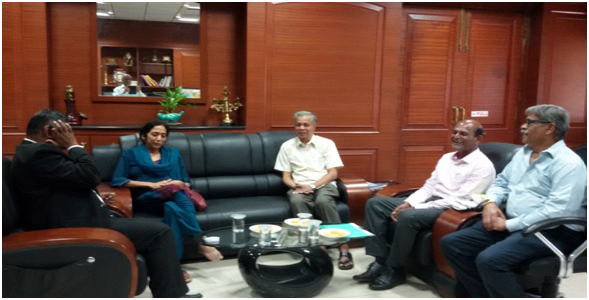 Further he explained in detail the activities of Association formed at Pune covering the entire Southern Maharashtra. Pune Association has so far organized two meetings in Lonavala & Mahabaleshwar and next meeting is scheduled to be held at Bhimashankar on 17-04-2016. He appealed to all members to attend this meeting. He pointed out that other Regions viz, Goa, Aurangabad and Nagpur shall have similar Association like Mumbai and Pune. After this, formation of a federation like structure can be considered. 5) Shri V. K. Khanna Vice-President of the Association, while speaking on the occasion, narrated work culture and pressure of work during his tenure. It is really to be appreciated that all members at the age of 60 years and above, attended the meeting at such distant environment, place, despite their health, transport and other unforeseen difficulties etc. which showed their energy and enthusiasm towards Association. He wished them good health. 6) Shri U.P.C Tauro Secretary of the Association, before getting the minutes of the last meeting ratified in the meeting, informed to all members that the minutes of the last meeting were circulated to all members & also printed in the News Letter 02. As such, the minutes of the last meeting were got ratified unanimously. 7) Thereafter, News Letter 02 dated 06/04/2016 was released by Shri R. Ganesan ex-Secretary to Govt. of India and Hon’ble President of the Association. 8) Shri R Ganesan president of the Association, in his key-note address,spoke on the topic of “Who am I? “, the knowledge of which will bring lasting happiness in life, free of guilt and hurt, as these two generally keep coming back again and again in one’s life as age advances. A background paper on the subject has been separately e mailed to those members who wanted to go into this topic in greater detail. 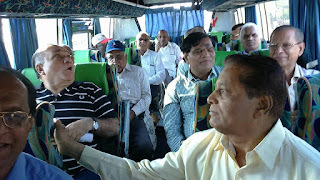 9) In between the talk, a visit was arranged in the Tiger Safari Park for all members in a bus at 12.0 p.m. On return back to the venue, the talk on the topic of “Who am I?“ was continued by Shri R Ganesan president of the Association. Lunch was organized on the venue (Bungalow No.07/01, Sanjay Gandhi National Park) at 13.30 p.m..
i)For deciding logo and motto of the Association, Shri S V Narayankar and other members were asked to suggest logo & motto of the Association and come up with a proposal to decide in Annual General Meeting . ii) It was decided unanimously to hold the Annual General Meeting (A.G.M.) at Conference Hall, Inspection Quarters, Dadar H.O. Building 5TH floor on Saturday the 25th June 2016 at 11.0 a.m. followed by Lunch. iii) For Registration of the Association,it was decided to take up this issue with Govt. of Maharashtra when membership of the Association crosses 50 numbers. 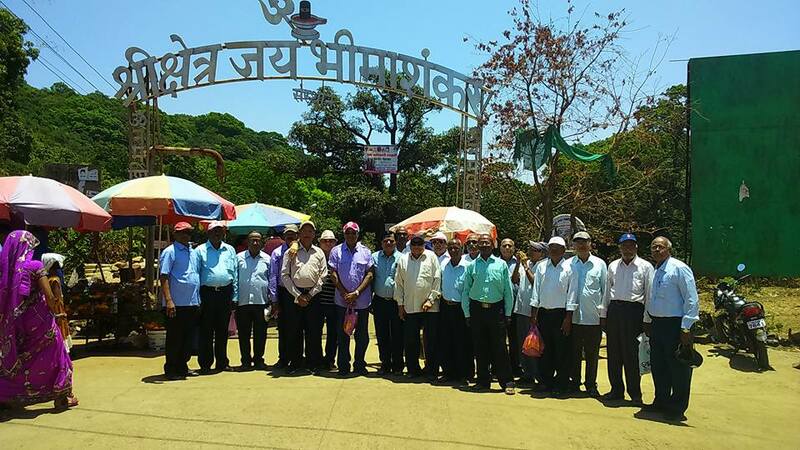 11) All members visited Kanheri Caves in a separate transport organized by the Secretary IPROA at 02.45 p.m. from the venue and returned back to the venue for hi-tea at 4.15 p.m.
12) During hi-tea, the following issues were discussed. i) For nomination of Internal Auditor, the name of Sri J S Patil came up for consideration. However, President of the Association opined that the Internal Auditor should be a qualified person from Account line. Pending finding a willing person from this category, Shri. J. S. Patil will audit the annual accounts for the year 2015-16.This will be again discussed during the next meeting. (b) News letter would be published twice in a year provided the regular meetings or annual meetings are held and subject to availability of funds. (c) Website should be created free of cost and contents of new letter may be incorporated therein. 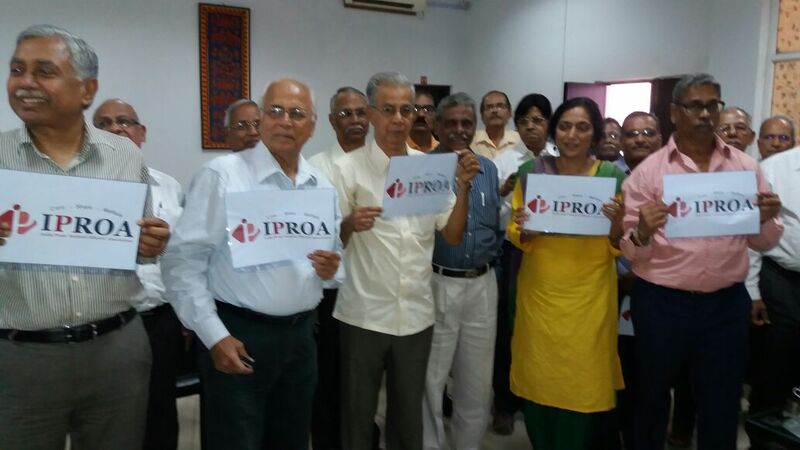 13) The meeting of IPROA was concluded with vote of thanks by Shri S A Siwal at 05.0 p.m. The Executive Members of the Association consisting of Shri R.Ganesan President, Ms Humera Ahmed, Vice President Shri U.P.C. Tauro Secretary & Shri W.S.Janbandhu, Organising Secretary met Shri A.K.Dash Chief Postmaster General Maharashtra Circle Mumbai in his chamber on Thursday the 4th February 2016 at 11a.m. Shri P.N.Ranjit Kumar, Postmaster General Mumbai Region & Shri Sayeed Rashid, Director of Postal Services (HQ) were also present. 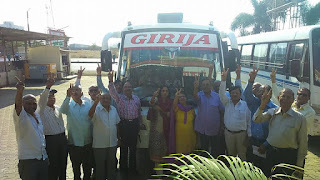 Chief Postmaster General Maharashtra Circle Mumbai was informed that the retired Officers of India Posts have recently formed an Association in Maharashtra Circle. 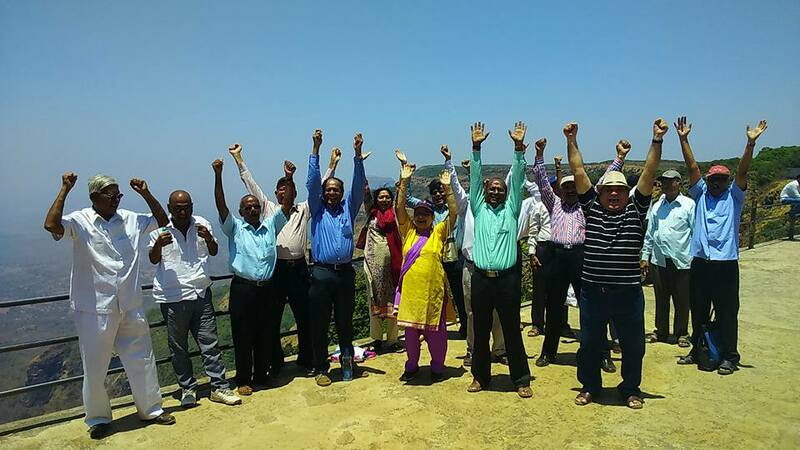 The scope of the Association is for retired Officers of India Posts, with particular focus towards those retired officers of Maharashtra Circle comprising States of Maharashtra and Goa. Good wishes and support of CPMG, Maharashtra & Goa was sought to serve the community of retired officers Posts in our circle. He was also apprised of our need to approach the Head Offices of Mumbai Region to seek particulars of Officers who had retired/retiring. This will help us to approach them, explaining the objectives of this Association and if they, so desire, can join us. They will get the benefit of continuing their life as a community of Pensioners and Senior Citizens who were all together for decades before their superannuation. Hence, CPMG’s help and support was requested for enabling us to fulfill the above cause of serving the retired Officers of India Posts. 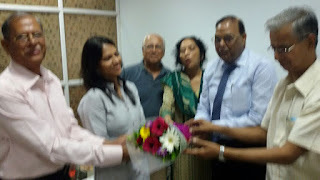 Chief Postmaster General Maharashtra Circle Mumbai was kind enough to receive us cordially. He assured us of all help and support to the Association. He has also permitted the Association to use the Auditorium at Mumbai GPO Annex Building as well as Dadar IQ for the meetings of the Association. Shri P.N.Ranjit Kumar, Postmaster General Mumbai Region has also assured to help the Association to get the particulars of Officers who had retired/retiring from the Head Offices of Mumbai Region. The members of the Executive committee who attended the meeting thanked CPMG, PMG, Mumbai Region and DPS (Hq) for their support. 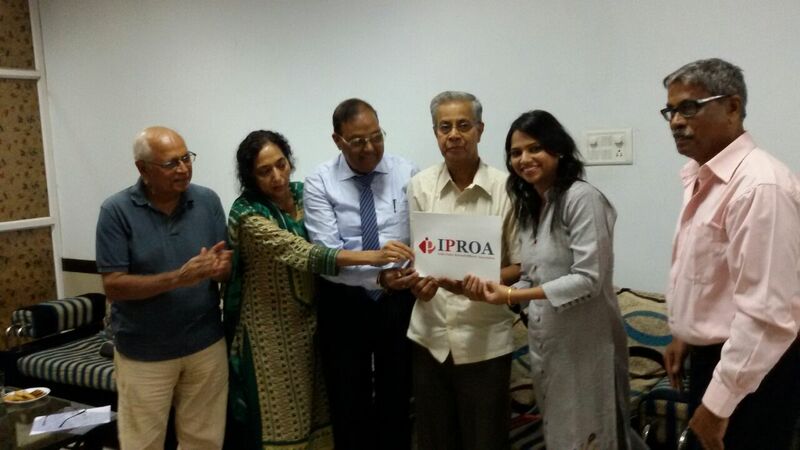 India Posts’ Retired Officers’ Association is a voluntary organisation. 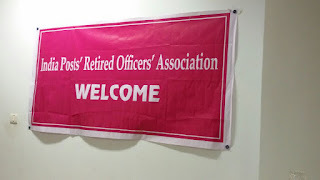 The scope of the Association is for retired officers of India Posts, with particular focus towards those retired officers of Maharashtra Circle comprising States of Maharashtra and Goa. The concept of forming this Association is keep together the officers of the Department who have spent a life time while in service and who generally drift away as individual units after retirement in isolation of one’s own family. They need to have a community life more at this stage of their life and that is fulfilled by our Association by bringing together on a common platform so that they can continue their camaraderie with their longtime friends. Such Associations for our retired officers are functioning very successfully in many Postal Circles of India Posts, but not in our Circle. 1. To attend to all the issues pertaining to the members of the Association with regard to their pensionary and other benefits, individual or collective, within the frame work of the Central Government Rules and Regulations in force. 3. To support any activity for the community of Senior Citizens. The membership of the Association is open to any person who retired as a Gazetted Officer of India Posts which includes ASPO/ASRMs who have gazette status. Ordinary Member: Any retired Gazetted Officer of India Posts who pays an annual subscription of Rs 400/-shall be an ordinary member of association Life Member: Any retired Gazetted Officer of India Posts who pays at any time 10 times the annual membership in force at the time of application for life membership becomes a Life Member thereafter. Many of our current members and those who are likely to join our Association in the coming months and years may know me personally as they must have worked with me when I was PMG, Mumbai Region and Controller, Mail Planning & Operations (CMPO) -Mumbai between 1992 & 96.Thereafter, I was with Bhabha Atomic Energy Centre, Dept., of Atomic Energy as its Controller till 2000, when I was still circulating among our colleagues in Mumbai. It was my desire to return once again to this most functional circle while I was CPMG, UP, that brought me back in 2002 to Mumbai as its Principal CPMG. I spent more than one innings in Tamil Nadu to which I was initially posted and in Maharashtra, thus justifying my liking. When I left Mumbai finally in 2005 after my retirement from the Department, I thought it was final, to settle in my native town. But events happened otherwise, bringing me back to this city couple of years ago, which I always considered as one known for its functional and philanthropic culture. Life, while in service and post retirement, is to oscillate between these extremes; from being somebody while in service to nobody when you leave the organization for good. People do long for company as we are all born in society and not in caves. As I was looking this kind of Association in Mumbai and talked to my erstwhile colleagues, I moved from no response to happy ones. In this context, I must acknowledge with thanks the ready response of Shri.Atul Srivastava, Ms Humera Ahmad and of my old pal Shri Janbandhu who shared all the pressures of the office of HOC with me. They agreed to my suggestion that we must organize ourselves into a body of retired officers to restore our friendship of the years that had gone ahead. Further, I was told that Col.Mishra V.S.M. (Retired) is also very favourable to the idea. We started the venture of India Posts Retired Officers Association in Mumbai keeping the fingers crossed and as feared our progress was discouraging until recently with more members joining our efforts, thus giving boost to the new Secretary Shri Tauro to make more progress to that extent, that gives us now the confidence to register the Association, which will be considered in our next meeting in April, 2016. I have no words to express my happiness that at last now we are on the take off mode. When we leave our job after years of toil at 60 years or otherwise, we do feel like saying ‘enough is enough’. But as we grow older most of us do feel the need for community life. This may come to some from the neighborhood. But for many in busy cities like Mumbai where we do not know who is in the next flat, this looks to be a remote possibility. To fill this gap of living in a society and not in the CAVE of one’s flat, the Association concept is thought of. I am sure that it will not fail to make us share our community feelings for one another. Already I see its visible sign in the way people share their messages with all the present members through the medium of What’s App. More ideas will emerge as we go along and I look forwards make the best use of this Association to make life of one another happier. This sharing and caring is the best medicine in our lives now to keep off avoidable ideas which isolation gives. I am sure that all of you will agree with me on this. Friends, I wanted take up this write up after the budget of the financial year 2016-17, as like many of us, I was hoping some announcement for in the budget. At present, all that is available is that the report of empowered committee on the 7th CPC is awaited and thereafter its implementation will be considered based on their report. Having waited so long we now seem to coming closer to hearing some good news to keep us away from the pressures of inflation driven economy. By the time this news letter reaches you, I hope we may have good news to share. Please rope in as many members as possible to the Association so that in the next 3 months we must touch one century. It is not only good for the group, but also for all those who come together under the umbrella of IPROA as we will have more ideas for better lives. As every day passes, we add a day to this life. Yet we must stay young in mind and spirit, though the physical system may feel otherwise. I am keen that we make the best use of this forum to help one another not only for positive feelings but also to overcome pressures arising out diminishing physical strength. There are ever so many ways of doing this. Let them all unfold in our deliberations in order to flowering our lives as a community member. Yes, for long all our family demands as also those of our careers made us seek more and more for completing those responsibilities. Nothing wrong, it had to be gone through to ensure that our responsibilities to the family and the organization we belonged are met. That meant we had to be consumers of all that was around, with little scope being contributors outside our sphere of demands. That is essentially a life of living with our needs only. Now it is different, nil or minimal needs, being generally empty nest and no pressures of office. This is God sent opportunity to grow outward, become a contributor to the society, the right way of maturing to get grater satisfaction out of being Humans. 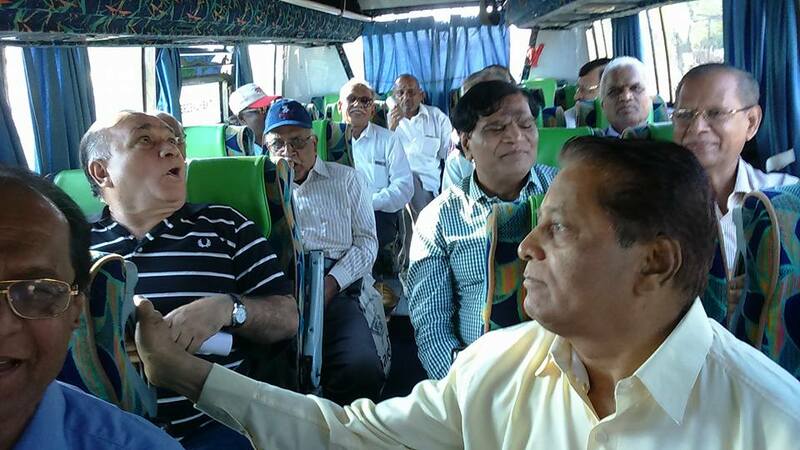 That opportunity to mature is offered by such Associations meant for retired persons who are also Senior Citizens. We live for us and for our brethren too. This is what even Department of Pensions expects us to do to get their recognition. They want pensioners’ Association to be for the community at large, apart from taking care members’ interest. Community does not mean worldJoining neighborhood groups to help hapless ones, young or old, teaching what we know to those who need anything under the sun is service at large. We may be already doing these in our way. Share these experiences with other members so that more ideas flow, for all to join hands and contribute in any way one can. The Association looks forward to the members to share their experiences and give scope us to help one another. Thus we become everybody’s from nobody, post retirement, after being somebody while in service! I must thank Chief PMG Maharashtra and Goa for the courtesy extended to us when we met him and along with PMG, Mumbai and DPS, HQ, on 4th, February 2016. He has offered to help us and that should give us more strength. That is a very good start. With a view to bring into existence a centrally controlled administered mechanism involving Pensioners Associations in the country, the Pensioners' Portal would function as a single window mechanism. The Department of Pension & Pensioners’ Welfare is the nodal department for formulation of policies relating to pension & other retirement benefits of Central Government Pensioners/Family Pensioners. It also serves as a forum for redress of Pensioners' Grievances. Department of Pension & Pensioners’ Welfare has set up a Standing Committee Voluntary Agencies (SCOVA) 1986 as per the recommendations of Parliamentary Consultative Committee to mobilise the voluntary efforts to supplement the Government Action. It is a useful forum for holding consultation with the stakeholders, i.e., the pensioners through their Associations. It provides the Associations an opportunity for raising their problems directly before the concerned Ministries, as the officials of these Ministries are also present in the meeting. It also provides valuable feedback to the Government for effective implementation of the programmes and gives direction for the future course of action. It has maintained a healthy tradition of constructive discussion. 7th CPC: With absence of an explicit overall provision for the 7th Pay Commission in budget raising questions, government on Wednesday said the once-in-a-decade pay hike has been built in as interim allocation for different ministries and budget numbers were credible. The voluminous budget documents state that “the implementation of the Seventh Pay Commission due from January 1, 2016 is to be implemented during the financial year 2016-17 as also the revised One Rank One Pension scheme for Defence services.” “The government has made provisions for the additional liabilities on these count,” it said, without giving the amount allocated for implementation. Release of additional installment of Dearness Allowance to Central Government Employees & Dearness Relief to Pensioners due from 01/01/2016. 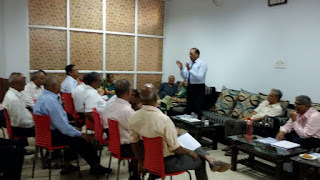 1)The Meeting of India Posts’ Retired Officers’ Association was held on 10-10-2015 at 3.00pm in the Conference Hall of Dadar IQ 5TH floor Dadar under the Chairmanship of Shri R Ganesan Ex-Secretary, Posts. 3) Inspite of various efforts undertaken at different levels during the last 3 meetings to maximize the membership as well as the attendance of retired officers, there appears to be no appreciable progress as yet. As such, Shri R. Ganesan, Chairman of the Association suggested the following 3 points for future course of action. a) Non-Gazette officials may be permitted to join this Association. b) Timings of holding next meeting shall be kept in the morning followed by lunch. To begin with, meetings can to be held in the forenoon as seemed to have been desired by many members, followed by lunch which will be funded this time from the membership collected already. If the participation is of decent level and there is enthusiasm for such gathering to be continued then we can let the experiment to continue. 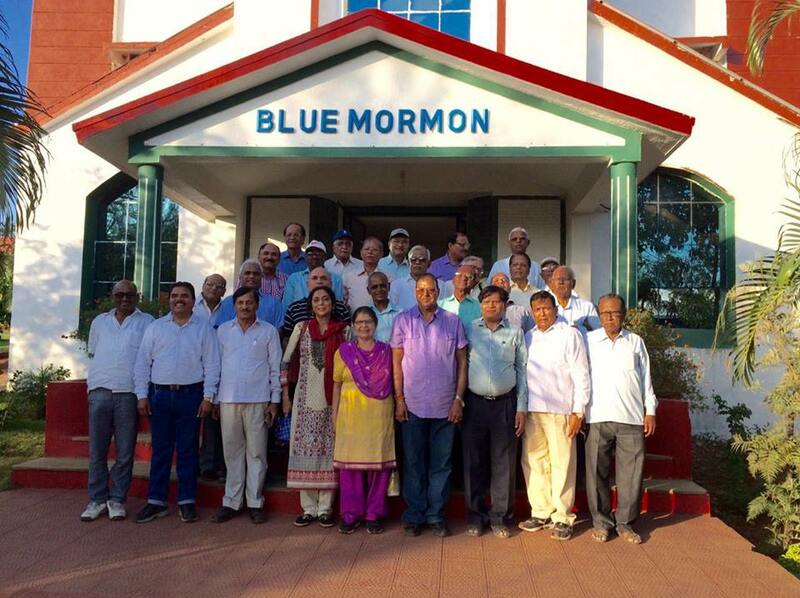 If in spite of the above arrangement done at the option of many members, if the attendance is not satisfactory indicating lack of enthusiasm to be part of this new Association, we can fix a meeting again after sometime, say in Feb., 2016, with a formal agenda to dissolve the Association. When there is consensus to dissolve the Association the February, 2016 meeting, we can formally declare so. i. All those who attended the first meeting, but did not attend any other meeting, their entire contribution of Rs.1000/= to be refunded as from their lack of participation it is evident that they had no intention of continuing. ii. For others, who have been coming to the meeting subsequently after the first meeting, their money will be refunded minus the expenses. iii. In case the expense are more than the subscriptions received, I will defray the excess as one who took the initiative, perhaps without testing the waters!!! 4) Members present in the meeting stated that the entry of membership to this Association may be restricted up to Group “B” to Group “A” and above level. A cadre of ASPOs/ASRMs having status of Group “B” level shall also be allowed to be a member of this Association. This is unanimously accepted by all. 5) Shri R B Kadam, Secretary of the Association, has stated that he is doing higher studies and does not get adequate time for doing the work of our Association. Therefore he requested to assign his work to someone . As such, Shri U.P.C.Tauro has unanimously been made the Secretary of the Association. Shri U.P.C.Tauro has willingly accepted this task and he was thanked for his gesture. 6) Next meeting will be held on 19-12-2015 (Saturday) at 11.30 am in the Conference Hall of Dadar IQ 5TH floor Dadar under the Chairmanship of Shri R Ganesan Ex-Secretary, Posts. 7) The meeting was concluded with vote of thanks by the Chairman of the Association. 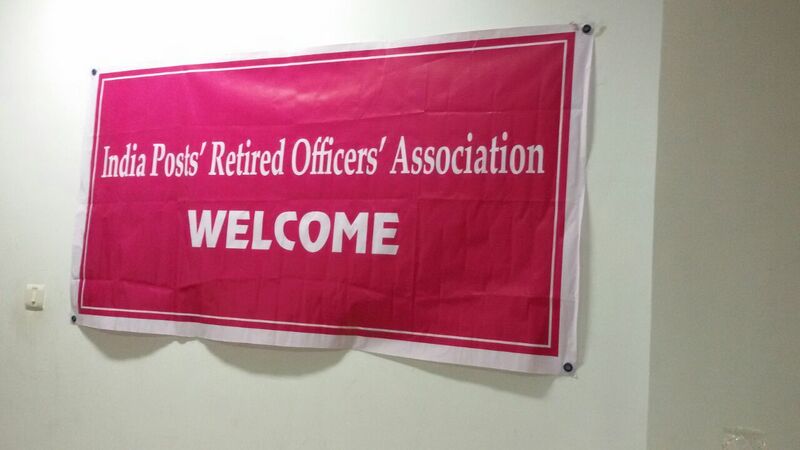 The Meeting of India Posts’ Retired Officers’ Association was held on 19-12-2015 at 11.30 am in the Conference Hall of Dadar IQ 5THfloor,Dadar under the Chairmanship of Shri R Ganesan Ex-Secretary, Posts. 2) 20 Officers attended the meeting. Following 04 new members were present in the meeting. 3) At the outset, Shri W S Janbandhu, Organizing Secretary, welcomed President, vice- Presidents and all Members present in the meeting. He further mentioned that there are three important subjects on the agenda which are beneficial to all Members for their post-retirement life and requested all of them to hear patiently. He requested Secretary to read and get confirmed the minutes of last meeting. 4) The Secretary read out the minutes of the last meeting and got confirmed with an approval of all the members present in the meeting. 5) Thereafter, Shri R Ganesan President addressed all members. First of all he thanked Mr.Tauro Secretary for all the efforts taken to keep in touch with all the members and also to organize today’s meeting successfully. He stated that he was happy to see the enthusiasm among members to participate. However the attendance of members needed improvement as per his expectation to make the Association more effective in attending to the issues which may come up in future. He then elaborated the details of earlier CPCs relating to pensioners and added that the7th CPC has more or less maintained the status quo in respect of most of the benefits, with only incremental changes in keeping with inflation linked pay hike for the serving employees. He further stated that the Association Secretary will give details of 7th CPC before concluding the meeting. He also suggested in the context of the letter written to AD (PSR) seeking permission to hold the meeting in Dadar IQ, to write a letter to CPMG, Mumbai about our Association and also fix a meeting with him in the first fortnight of January 2016 so that it can be given to him personally and apprise the HOC about us. 6) Col.K C Mishra VSM Vice- president of the Association, before giving his speech on “Holistic Health Care and Wellness”, thanked all. 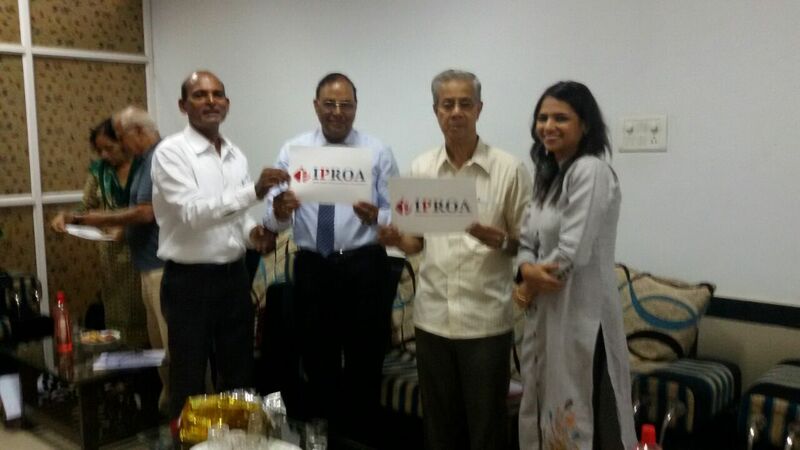 He stated that he would like to share the activities of retired officers’ Association at Pune. 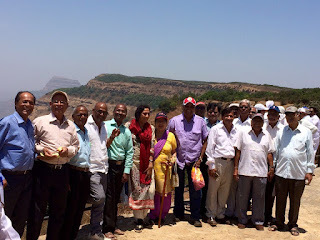 He mentioned that the information of retired officers was collected through Post Offices from where they get their pension, and kept a meeting at Lonavala for a day wherein more than 30 retired officers residing in Pune attended the same, discussed various issues and enjoyed a lot. He further mentioned that the next meeting would be organized at Mahabaleshwar which received spontaneous response from members. He stated that the Charity Commissioner, Pune has also been addressed for registration. vibration therapy, Naturopathy medicine, Acupressure etc. He briefed about food that are to be taken in our daily diet and those foods which need to be avoided for better health. The speech was very useful for our members to keep fit in their day to day routine life. All have appreciated this. 7)Shri V K Khanna while speaking on the subject of “ Opportunities to Retired Officers for their gainful engagement“, mentioned that now- a -days lot of skill is sought for engagement of job. But he stated that any kind of job or job requirement, dedication is more important. He gave example of Shri Sakalkale ex-CPMG. He preferred the job of teaching where the remuneration was small but gets free time than getting a job for more than 8 hours. Part time employment is necessary for retired officers; they can join NGOs or healthy Societies as managers which is a part time job. He did not recommend job for enterprises as one would lose peace of mind, any job for retired personnel would depend on how much time he could work. 3) Part time engagement in Govt. (b) Multiplication by 2.57 to the pension fixed at the time of implementation of 6th CPC, Option given to the pensioners for choosing whichever formulation beneficial to pensioners, increase/decrease in pension, medical facilities available, and FMA etc. (a) To arrange 3 meetings of the Association in a year, say in April, August and in December. It was agreed after discussion that we could meet in different locations to make the meeting more interesting. There was a suggestion to hold the next meeting at Borivali National Park. This can be done if there is suitable place in the Park for holding such a meeting. It may be ascertained and if found suitable, the meeting can be held there. Regarding this, Secretary, ShriTauro will communicate along with date, time, and the payment that includes breakfast, tea and lunch etc. and also entertainment by willing members. Any balance will be refunded to the members. (b) He welcomed more persons to talk on topics of interest to retired persons who are also Senior Citizens and on geriatrics as relevant to them as they grow old. We must focus not only on treatment of a problem but also on preventive health similar to what Col.Mishra V.S.M. had talked to us. This can be followed by two minutes “talk “by all members present in the next meeting. As the duration of that meeting could be of 5 to 6 hrs, the meeting will start by 10.00 am and end by 5.00pm. (d) President requested the Secretary and the members to use their contacts to get list of officers retired from the PO to increase the membership further. 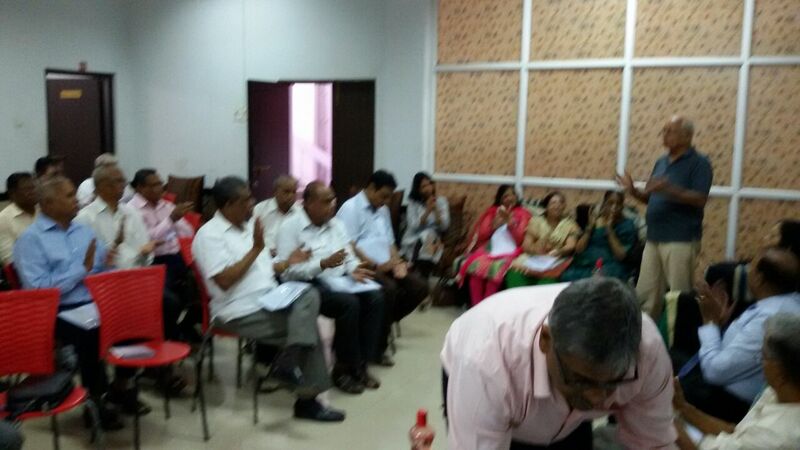 10) The meeting was concluded with vote of thanks by Shri R B Kadam. Victoria Road, Cross lane - III, Byculla(E), Mumbai- 400027. RIDDHI VINAYAK ,CRITICAL CARE & CARDIA CENTRE 559/1,Riddhi Vinayak Temple Lane, Near N.L.High School, S. V. Road, Malad (W), Mumbai-400064. SURANA HOSPITAL & RESEARCH CENTRE Tank Road, Next to Skywalk Tower, Near Orlem Church,Shanker Lane, Malad (W), Mumbai 400 064. SURANA SETHIA HOSPITAL RESEARCH CENTRE Suman Nagar Sion Trombay Road, Chembur, Mumbai- 400 071. Veena Nagar, Phase II, Near Swapna, Nagari, Model Town &Tulsi Pipe Lane, Mulund (W), Mumbai-400 080. APEX HOSPITAL Vaishali Heights,Chandavakar Road, Borivali (W), Mumbai- 400 092. A Wing, Bhaveshwar Plaza , Opp Shreyas Cinema, Ghatkopar (W), Mumbai – 400 086. ASIAN INSTITUTE OF MEDICAL SCIENCE Plot No. P-72, Milap Nagar , MIDC, Dombivali(E),Thane- 421203. Kohinoor City, Kirol Road, Off LBS Road, Kurla(W), Mumbai –400 070. Plot No. 22- A, Palm Beach Road, Sector 6, Nerul, Navi Mumbai – 400706. Plot No. 302, Near Railway Carshed, Virar Nalasopara Link Road, Nalasopara (W), Thane. AAROGYAM MULTI SPECIALITYHOSPITAL ,Opp. Mangala High School , Kopari, Near Thane Railway Station (E), Thane - 400 603. Plot No. 21, Near Ekta Society, Sector – 6, Ghansoli, Navi Mumbai - 400 701. Plot No. 57, CRW, CHS Near MIDC water tank, Kalyan Road,Dombivali (E) – 421 201. Seven Hills Health City, Marol-Maroshi Road, Andheri (E), Mumbai-400 059. Multi-Specialty Hospital, Plot No. 69/2, Near Hotel Garden, Panvel– 410206. Phase-VII,Mira Bhayander Road, Near Flyover Bridge, Mira Road (E)Thane - 401 107. Kurla Camp Rd., Opp. Shanti Prakash Hall, Ulhashnagar – 421005. Aastha Health Care, Off. L.B.S. Rd, Opp. Cheda Petrol Pump, Mulund Colony, Mulund (W) Mumbai –400082. A-120/103, Shree Balaji Co- Op-Hag , Socity, Near Makamali Talao, LBS,Road(Agra Road) Panchpkhdi, Thane - 400 601. Aasra Apartment, Plot No.33, Near Station Road, Ambernath(E). “C” Wing, Rathod Nagar, Gr. Floor, Behind Raja Hotel, Near KDMC Office, Kalyan (W). SpentaMansion , S. V. Road, Andheri(W) Mumbai – 400 058. VASAN EYE CARE HOSPITAL Mahavir Ratan Bldg, Plot No.113, Sector 12 , Vashi Navi Mumbai. 1st floor, Rizvi Nagar, Next to Milan, Milan Subway, S.V. Road, Santacruz, Mumbai-400 054. MAHATME HEALTH AND HAPPINESS HOSPITAL Saukhya, Jairamishana Co-op, Hsg Society, Deshmukh Wadi, Mithagar Road, Mulund (E),Mumbai – 400 081. Jyoti Apt. Ground Floor, 7 Bunglows, Bus depot, Andheri(W), Mumbai – 400 053. Level 4 & 5, Amber Arcade, Bhiwandi Bypass Road, Near Lodha Paradise, Majiwade, Thane (w) 400 601. The Standing Committee of Voluntary Agencies (SCOVA) is a forum for holding consultation with the stakeholders, i.e., the pensioners through their Associations and various Ministries/Departments of the Government of India, to get feedback on implementation of pension related policies, to discuss and critically examine the policy initiatives and to mobilise voluntary efforts to supplement Government action. The last reconstitution of SCOVA was done vide Ministry of Personnel, Public Grievances and Pensions, Department of Pension and Pensioners’ Welfare’s Resolution No. 42/08/2013-P&PW(G) dtd 25.08.2015. This was stated by the Minister of State for Personnel, Public Grievances and Pensions and Minister of State in Prime Minister’s office Dr. Jitendra Singh in written reply to a question by Shri Mahendra Singh Mahra in the Rajya Sabha today. 10.45 a.m. “Who am I” Talk by the President of IPROA. 11.45 a.m. To decide logo & motto of the Association. 12.05 p.m. To nominate Internal Auditor & Joint Secretary to the Association. 12.45 p.m. Visit to Nature Information Centre.